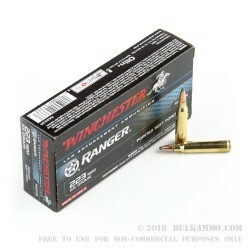 Law enforcement agencies frequently use Winchester Ranger ammunition for its consistency and high quality. 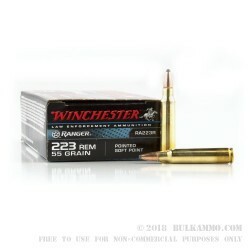 This .223 Remington ammo uses a 55 grain soft-pointed bullet that leaves the muzzle at 3240 fps and expands immediately upon hitting its target, making it ideal for self-defense use in AR-pattern rifles. 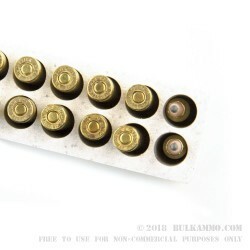 Each box contains 20 rounds and uses new Boxer-primed reloadable brass cases. Winchester is a world-renowned manufacturer and designer of ammunition founded in 1855 as the Winchester Repeating Arms Company. A top supplier for law enforcement, the company currently focuses on producing premium defense ammunition in the Ranger, PDX1, and Silvertip lines as well a variety of range and cowboy action offerings. For over 80 years, Winchester has been a division of the Olin Corporation, an industrial conglomerate founded in 1892 and located in Missouri. The company spun off the firearms business in 1980; today, FN and Browning hold licenses to produce Winchester-branded guns. My range is indoor, so I only have 25 yards to work with. That said, I tested a few cartridges for short (very short) range consistency in my ar-15, so take it for what it's worth. High quality ammo for a very hard to beat price.